Scotch Whisky is produced all over Scotland and can be broken down into 6 regions, Highlands, Speyside, Lowlands, Campbeltown, Islay and Islands. Scotch is like Wine in that the location of where it's produced makes a big difference to how it tastes, looks and smells even though it's produced in the same country. Scotland isn't the biggest country, but the differences in location to how the can Whisky taste is phenomenal. 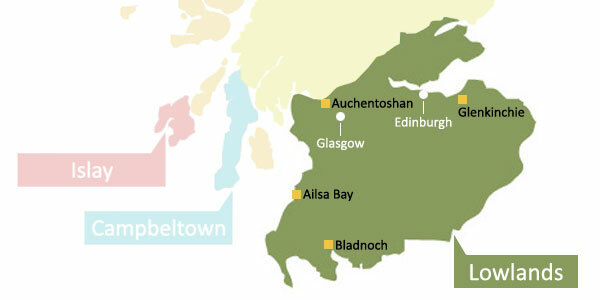 Coastal distilleries will produce whisky that tastes nothing like an inland whisky and a single malt from one of the islands distilleries will be different from one from the heavily condensed area of Speyside. 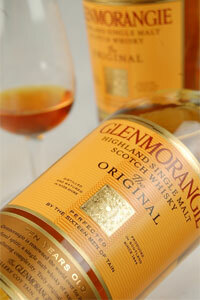 Even within regions a whisky can have completely different notes and aromas. Scottish whisky is world renowned so it's important to distinguish the difference, every region has a whisky powerhouse that can be found in most bars around the World. 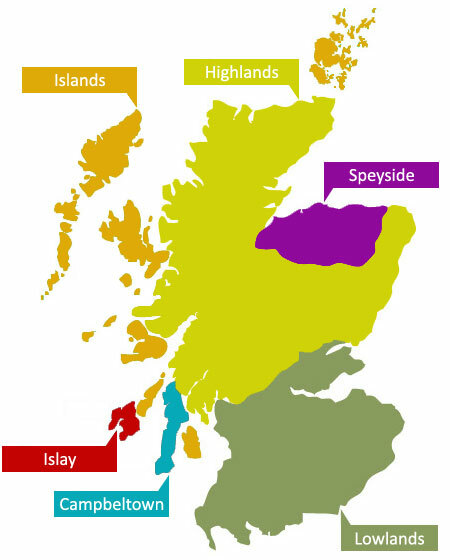 Below we've listed details about each Scottish Whisky region covering some famous names, notably aromas and flavours and how to differentiate from region to region. The Highlands is Scotland's largest whisky producing area, covering anywhere from the north of Glasgow (the Clyde estuary to the River Tay) all the way to Thurso in the north, not to mention the east and west regions excluding Speyside. 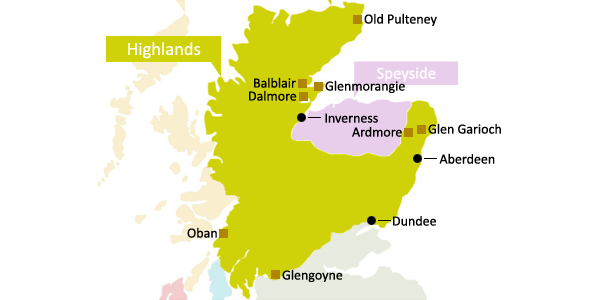 Due to the large area, whisky in the Highlands is very diverse and offers a vast amount of different flavours so it's hard to put a certain style on Whisky from this region. It's easier to split the Highlands into four subregions, north, east, south and west. Each of these subregions has its own style. In the North you’ll find full bodied single malts, sweet & rich in character, Glenmorangie & Dalmore being two of the more recognisable whiskies. 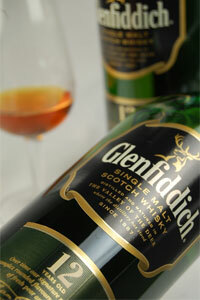 Lighter, fruity whiskies are more commonly found in the east, such as Glendronach and similar drams are found in the South, these would commonly have a touch less body, such as Aberfeldy. The Western Highlands offers full body with a peaty punch, the coast has a great influence on those whiskies, Oban being one of the bigger names. Due to the size of the Highland area, these distilleries make up 25% of all Whisky produced in Scotland, if you then add the neighbouring region of Speyside into this then the figure rises to as much as 85%. 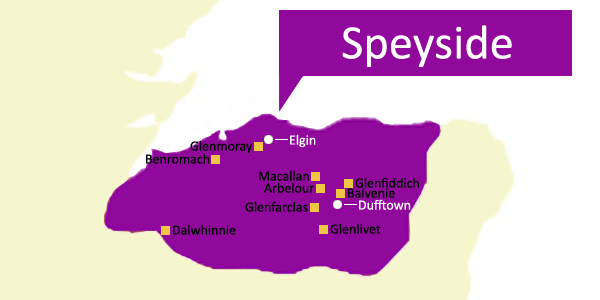 The region of Speyside is located in the north east of Scotland surrounding the River Spey, it's a sub-region to the neighbouring Highlands because of the high density of distilleries in the area. 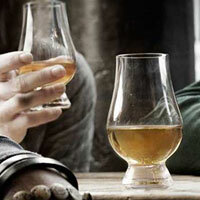 It's home to the highest number of distilleries in Scotland with well over 60 at present. Speyside is known for its wide range of whiskies displaying different characters, famously for sweet single malts with either very little peat or absolutely no peat present at all. Because of this style, Speyside tends to be a good entry level for those beginning their Whisky adventure as they allow the user to discover their favourite tastes when it comes to drinking single malts. Some of the World's most famous whiskies are produced in Speyside, Glenlivet, Glenfiddich and The Macallan are World renowned scotch whiskies, these three distilleries alone make up one-third of the entire single malt market. More than 60% of Scotland's entire single malt production is from the active distilleries of Speyside, this shows how important this region is in terms of exports of Scotch and Scottish produce around the World. Lowlands is the second biggest whisky region in terms of the area it covers, but it's currently only home to fewer than five distilleries. The Lowlands region covers the south of Scotland up to the north of Glasgow and Edinburgh where it meets the border on the Highlands, the line follows the old county borders running from the Clyde estuary in the west to the River Tay in the east, anything south of this is to the border with England is classified as the 'Lowlands' in whisky terms. 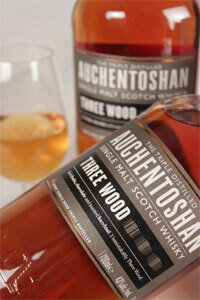 Lowlands whiskies tend to be light and gentle with no peatiness, unlike any other region they were once all triple distilled, only Auchentoshan uses this technique now for all of its production. Due to the inland location of the distilleries, there is little salinity within the Whisky, because of this Lowland Whiskies are a great entry into malt whisky. 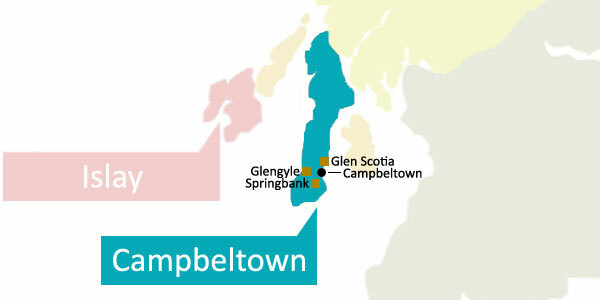 Campbeltown is part of mainland Scotland but it's found at the foot of the Mull of Kintyre and was once a thriving whisky hotspot with over 34 distilleries, however it's now home to just 3. Once at a high of 34, a slump in the 1850’s meant this number was halved and what followed was a calamitous fall from grace for Campbeltown. A mixture of improved transportation links to the rival distilleries in the north and a decline in quality as distillers cut corners for mass-production resulting in an inferior product. 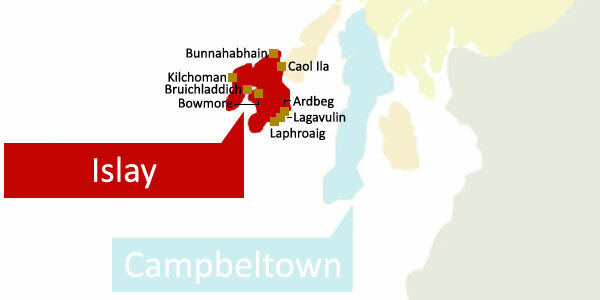 Today, Campbeltown Whisky is known for its dryness and sometimes pungency taste because of its location, the region sticks out of the mainland and is actually closer to neighbouring islands Arran and Islay than any other mainland producer. 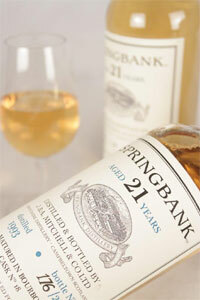 The region is relatively small, yet the distilleries produce very different whiskies from one another, Springbank is robust and heavily smoky whereas Glen Scotia now produces typically light and grassy whiskies. The Scottish island of Islay (pronounced eye-luh) is located to the west of the mainland and is the smallest Whisky region in terms of area coverage in Scotland. Even though it's a relatively small island, Islay is currently home to 8 distilleries, 3 of which are World famous, Ardbeg, Laphroaig and Lagavulin. The region is known for its peaty single malts and it's believed that whisky distillation reached Scotland from Ireland via Islay in the 13th century, hence the high number of past and present distilleries on the island. Scotch produced on the islands surrounding the mainland of Scotland offer a very diverse and different taste, they're not however recognised by the Scotch Whisky Association but are easily grouped together for geographic reasons as one as they're all islands. There are nearly 800 islands off of Scotland’s coastline with only a few are actually inhibited, it's easy to see why the varying style differentiates from North to South. 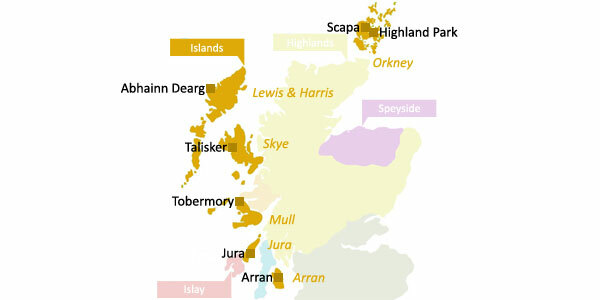 Of the inhibited islands, Orkney has 2 whisky distilleries, Scapa and Highland Park, Lewis & Harris is home to Abhainn Dearg, Talisker is located on Skye, Tobermory on Mull with Jura and Arran located on their namesake islands. Although diverse in flavours, peat and salinity are found in all of the Islands whiskies, the latter because of the vicinity to the sea. 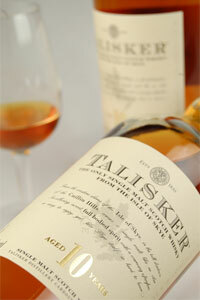 Talisker is currently the largest Island distillery in Scotland, with a capacity of 2.6 litres, you'll be sure to find a bottle of this in most bars around the World. 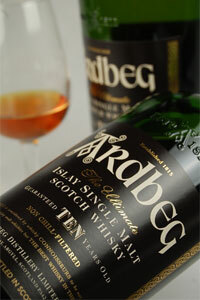 Click here to view our vast selection of whisky glasses which are perfect for Scotch Whisky. We also have a great collection of whisky decanters that are ideal for not only scotch whisky, but other spirits such as cognac, brandy, port and more! To purchase some of these fantastic whiskies, check out our friends at Hennings Wine Merchants, as well as The Whisky Exchange and Masters of Malt. Images courtesy of Hennings Wine Merchants.